The term God can be compete for the most misunderstood, most abused and hardly understood term in the dictionary. I was thinking about God and what major religions say about God. There are monotheistic religions that believe there is only one way to God - They are so sure about their ideology that everyone else is wrong, and they feel the urge to convert others to their faith. But, there is no concept of conversion in Hinduism because we believe there is more than one way to God. If anyone can think deeply about God, the first feeling that would come to them is pure AWE. The next feeling is humility. The third feeling would be probably laughter - because, they'll realize that God cannot be constricted to any particular way or thought or idea. One of my favorite deities is Sri Lakshmi Nrusimha Moorthy - This is the grand Lion/Human Form of the Lord that escapes all imagination. When the Infinite God, in all His mercy decides to incarnate (please note the word 'carna' indicating flesh as in carnivorous, carnal pleasures as of things related to flesh) it is ONLY to delight His devotees. Everything else is secondary. This Great Shloka was unfortunately named 'Death Shloka' in a popular Tamil Movie - Anniyan! God takes Form only to thrill His devotees. My friend's mom's eyes glow and well with tears when you mention the name of Baby Krishna. One of my aunts used to cry on remembering Murugan's bewitching Form. My brother-in-law's eyes light up as lightning on just mentioning the name 'Nataraja' (He is my secret friend too!). 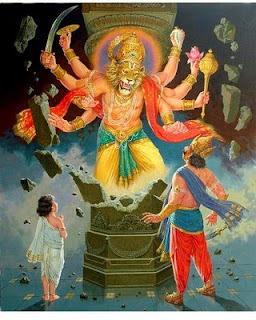 I cannot tell how much gladness just the mention of the name Nrusimha brings to my heart. When all Avatar's of Vishnu were planned, this one was unplanned. He was never born in conventional sense, grow up and then take His enemy. He appeared in an instant, finished His Samharam (destruction of evil) in a moment, and then He vanished. He did not do that to save Prahlada! Who else saved Prahalada when he was rolled down the mountains, fed with poison or thrown into fire? He came to add veracity to Prahlada's words that Sri Vishnu is Everywhere. Sri Mukkur Lakshmi Narasimhacharyar used to say that this Form of the Lord is His actual Form! Because, He had no time for make-up and had to come as is! It is called 'Avasara Thirukkolam' - A Form take up in Urgency. Lord Narasimha is also known for His speed! (Aditha kai piditha perumal - One who held the hand that broke the pillar in a trice) - He never asks His devotees to wait. He immediately Grants all their wishes. Someone was asking a saint why Lord Narasimhar doesn't appear even though there are 1000s of Hiranyakashipus (evil people) - The saint replied that there is not even a single Prahalada! (He is of this World - He is beyond too! Let's mentally Bow to the Supreme Divine who manifested in this wonderful Form. May He help us understand what being God is all about. Few years ago, I was asking one of my sisters (cousin) in US what is great about US? She told me that she doesn't have to worry about basic stuff (like electricity, water, milk etc) - This was a big deal then. I now think it is such a pain to do anything in India. May be it is one of my rare mood swings. But, I am sure something is wrong. 1. Yahoo India Small Business - Don't even try touching this with a long pole if you can. Avoid it like plague. We have been having a series of missed emails from CUSTOMERS!! When I logged a complain to YSB, there is not even an acknowledgement from them. Now I found their call center number, and when I talk to them, they were the rudest, and the lady thinks I am dud. I have been working in Internet technologies and software since 1996. I pity non-tech guys who have to interact with their call center. 2. Tata Indicom Photon+ - I took this mobile broadband connection service. It did not work initially, because they had not done their address verification. I hate terrorists. They blow up some place and everyone suffers. All addresses to be validated despite giving address proof 'personally' by Tata personnel. I made a few frantic calls, and finally it started working after a couple of days. Now, I haven't got the bill and they stopped my connection. My parents got a cryptic call telling that my payment was due. They did not listen when we tried to say that we haven't received the bill yet. 3. Curse of Follow-up - NOTHING WORKS without followup. I have been running around a range of people to whom I pay money get stuff done. The sad part is that I need to follow it up meticulously. What a waste of time and effort? I was thinking how much more productive I would be if I don't have to follow-up anything. Nobody takes OWNERSHIP. Nobody cares! Ownership is when people take up responsibilities and take effort to close the loop. VP of my previous employer's favorite term was 'closure' - I love that term. Sad that there is no one else with these values.